Three major developments could be identified during the second week of October 2017 – a US delegation visiting Pakistan preparing for a high level visit later this month, securing of an American-Canadian family who were kidnapped by the Huqqani group in Afghanistan in 2012, and a new round of Af-Pak tensions following Afghanistan’s refusal to take part in the scheduled bilateral transit trade coordination meeting. An important domestic issue, that is likely to expand further and even snowball, with international ramification would be related to the Milli Muslim League. During the second week of October, the Election Commission of Pakistan rejected the MML’s application to register as a political party. Three major developments took place – all inside Pakistan involving Islamabad’s engagement with the US. The first one was a statement, high on rhetoric by Pakistan’s Prime Minister that it does not rely only on the US. Second was an US visit led by Lisa Curtis, preparing for a high level American visit later this month. And the last development was the securing of an American-Canadian family by the Pakistani security forces. tatement in public that the days Pakistan depending on Pakistan were over. In the last few weeks, one could notice a high level of rhetoric in the Pakistani media; while some have been asking for a reset in US-Pak relations, majority have been asking for Islamabad sending a strong message to the US. After initial brouhaha a month earlier, Pakistan seems to be getting ready to host James Mattis soon. A delegation led by Lisa Curtis including the Ambassador Alice Wells and acting Assistant Secretary of Defence David Helvey was accorded a high level reception. 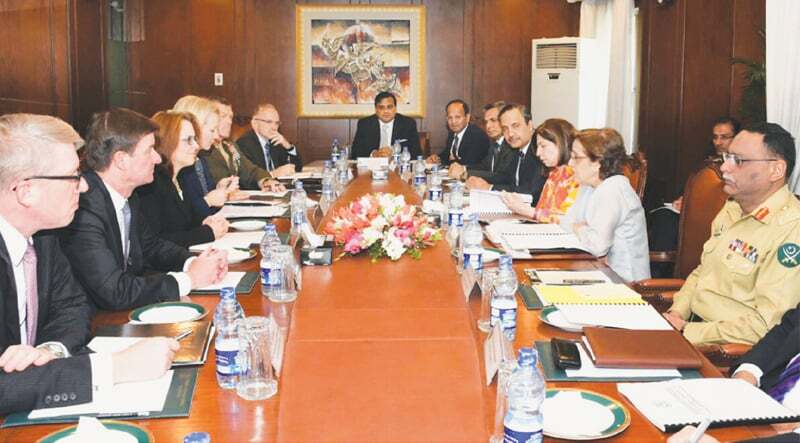 The delegation held discussions with not only Pakistan’s Foreign Secretary Tehmina Janjua, Foreign Minister Asif Khawaja but also Chief of the Army Staff (COAS) General Qamar Bajwa. Clearly, Pakistan despite the above rhetoric, cannot afford not to repair the relations with the US. The two visits by Asif Khawaja within a month to the US earlier should have already prepared the grounds for a more substantial talks with the Trump administration. Not only Khawaja visited the US, but the COAS visited Afghanistan as well. Pakistan has done its groundwork. The above delegation is a trial run, for a larger reset with the US. Later this month, the US Secretary of State Rex Tillerson and Secretary of Defence James Mattis are expected to visit Pakistan. The above meeting should be seen as an icebreaker. If James Mattis statement in a US Committee meeting on giving one more chance for Pakistan has opened some space, the recovery of an American-Canadian family by the Pakistani security forces further has created an environment. Where will the US-Pak relations go from here? An earlier analysis in Pakistan Reader mentioned about US-Pak Déjà vu; appears, this is a part of it. Just a day before the above visit by the US delegation, Pakistan's security forces rescued an American-Canadian family from their kidnappers. Coincidence? President Ghani met a Pakistan delegation in Kabul led by Gen Bajwa on 01 October. A week later, Afghanistan has cancelled a scheduled meeting of the Afghanistan-Pakistan Transit Trade Coordination Authority. Pakistan has responded negatively to this, blaming both Afghanistan and India for scuttling the Af-Pak bilateral trade. Pakistan’s fears over transit trade with Afghanistan have another component – Chahbahar. An Iranian exit for the Afghan goods would reduce the bilateral trade with Pakistan, undermine Pakistan’s plans for Gwadar port, reduce Pakistan’s influence on Afghanistan to open a land route to Central Asia, and more importantly undermine Kabul’s dependence on Pakistan for trade. The last part is what Pakistan fears the most. Pakistan’s apprehensions are not over losing the trade with Afghanistan. It is on losing its influence on Kabul. Chahbahar provides an alternative to Kabul and will reduce its dependence on Pakistan for trade.